President Trump spoke Wednesday afternoon from the South lawn of the White House after the Republican-controlled Congress passed a sweeping tax overhaul bill. The Senate passed the bill in the early hours of Wednesday and the House voted to pass the legislation Wednesday afternoon. "They've worked so long, so hard," Mr. Trump said pointing to the GOP congressional leadership gathered behind him. "It's been an amazing experience, I have to tell you. Hasn't been done in 34 years but actually really hasn't been done because we broke every record." He said the tax legislation would bring $3.2 trillion in tax cuts and double both the standard deduction and the child tax credit. He also claimed that a family of four earning $75,000 would see an income tax cut of more than $2,000. "It's the largest - I always say the most massive, but it's the largest tax cut in the history of our country and reform. Big tax cut. Really something special," he said. Mr. Trump was also happy to announce the bill's provision repealing the Affordable Care Act individual mandate. "I hate to say this but we essentially repealed Obamacare because we got rid of the individual mandate which was terrible," he said. Mr. Trump thanked Senate Majority Leader Mitch McConnell and Speaker of the House Paul Ryan, inviting both GOP leaders to speak. 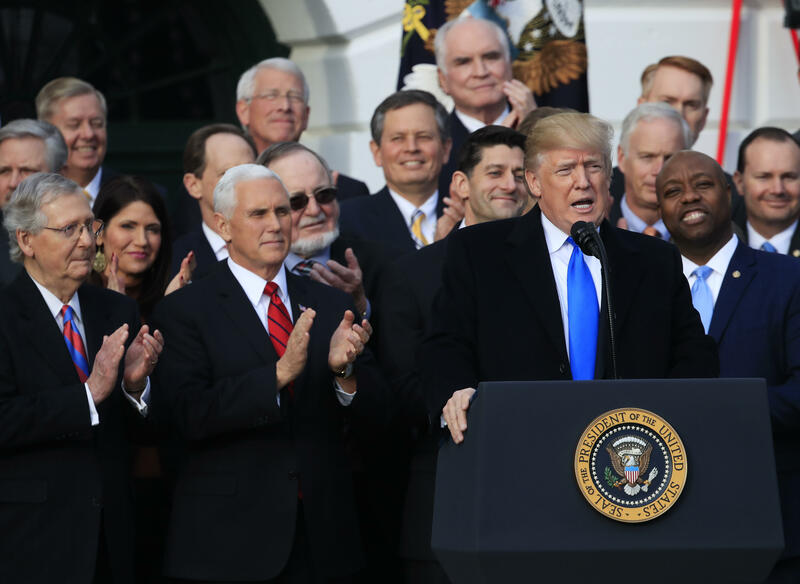 "Mr. President thank you for getting us over the finish line, thank you for getting us where we are," Ryan said, praising the fulfillment the Republican Party's pledge to deliver tax cuts to the American people. Mr. Trump thanked Congress again for its work in passing the bill. "They are very, very special people," he concluded, gesturing to the GOP members surrounding him. The president has not yet signed the bill, and he may wait until next year to sign because of a budget law called pay-as-you-go that requires Congress to impose spending cuts whenever it adds to the national debt. The tax bill adds $1.5 trillion to the debt over a decade. If either Congress suspends that rule or Mr. Trump waits until the new year to sign the tax measure, the spending cuts would delayed until 2019.